Today’s (Saturday’s) matches involving the area’s senior football clubs look set to go ahead despite the wintry weather. Hastings United’s game away to Merstham in Ryman Football League Division One South is on after passing an 11am pitch inspection despite a light covering of snow earlier. Bexhill United’s third versus second clash away to Wick & Barnham United in Macron Store Sussex County Football League Division Two has also been given the green light following an inspection. In the same division, Westfield’s fixture away to Haywards Heath Town goes ahead, although the ground is soft and further rain will mean another inspection prior to kick-off. Little Common’s visit from leaders Worthing United is also on. 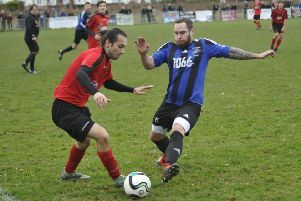 The majority of the day’s Macron East Sussex Football League encounters are also set to go ahead. See the full list below. Ryman League, Division 1 South: Merstham v Hastings Utd. Macron Store Sussex County League, Division 2: Haywards Heath Town v Westfield; Little Common v Worthing Utd; Wick & Barnham Utd v Bexhill Utd. Reserve Section (East): Bexhill Utd v Worthing Utd; Southwick P Little Common P; Westfield v Langney Wanderers 2. Macron East Sussex League (2), Premier Division: Hollington Utd v Peche Hill Select. Division 1: Icklesham Casuals P Hollington Utd II P; Little Chelsea P Mountfield Utd P (Little Chelsea unable to raise side); Sidley Utd v Sandhurst. Division 2: Catsfield v Crowhurst; Old Hastonians v Wittersham; Pebsham Sibex v Herstmonceux. Division 3: Bexhill-On-Sea P Sovereign Saints P; Eastbourne Athletic v Hooe Sports; Herstmonceux II v Visick; Ninfield Utd II v AFC Hastings; Peche Hill Select II v Hastings Rangers. Division 4: Bexhill AAC II v Westfield III; Bexhill Rovers v St Leonards Social II; Bexhill Utd III v Conquest Utd; Little Common III v West Hill Utd. Division 5: Grasshoppers Old Boys v Victoria Baptists; Mayfield P Hailsham Athletico P; Parkfield v Magham Down; Sedlescombe Rangers II v AFC St Leonards; Ticehurst II P JC Tackleway II P.
Division 6: Battle Baptists III v Punnetts Town II; Hampden Park Utd v FC Westridge; Orington v Hawkhurst Utd II; Robertsbridge Utd II v Icklesham Casuals II. Hastings & District FA Junior Cup, 2nd round (1.30): Battle Baptists II P Ticehurst P.
Robertsbridge Charity Intermediate Cup, 3rd round (1.30): Rock-a-Nore v Ninfield Utd; St Leonards Social v Sedlescombe Rangers; JC Tackleway P Iden P.
Robertsbridge Charity Junior Cup, 3rd round (1.30): Hawkhurst Utd v Northiam 75; Peasmarsh Utd v Bexhill AAC.